1. A woman named Stamato, from Lesinitza of Zagoriou, who had a paralyzed and fixed right hand for two months, hearing of the Saint, hastened with piety, having her father and father-in-law with her. It was a Saturday evening when she reached the tomb of the Saint, and having spent the night at the tomb, Sunday morning she was found healthy. Receiving this, and her father and father-in-law left rejoicing. 2. An eight year old child, from that surrounding area, who was speechless and had paralyzed feet since birth, was placed by the Saint’s tomb with many other sick people, and was healed to the amazement of all, and began to speak, and to walk freely. 3. Also two young siblings, a boy and a girl four and eight years old, who were both paralyzed in their feet, were both healed. 4. Similarly another eight year old child from the town of Loggon of the Eparchy of Dryinoupolis, paralyzed since birth, came to the tomb and was healed. 5. A woman named Katherine from the town of Pramanta of Tzoumerkiou, who suffered from harsh pain in her insides, approached with reverence and was healed. 6. A twelve year old girl from Metsovo, suffering continuous and longstanding lunar problems [most likely epilepsy], came with piety to the tomb and was healed. 7. Furthermore, a four year old child named Nicholas from the town of Doliana, paralyzed for three years, was brought by his mother Despos to the tomb of the Saint, and after three days was healed. 8. Also the wife Stasine from the town of Kripovon, suffering from a dangerous wound over her whole body for about three years, the same experienced by her two year old son, who was born with the same condition as his mother, was told to go to doctors in Ioannina by many, replied: “I want to go to the true doctor, the Neomartyr George”, and she came with fervent faith, and was freed from her condition, along with her child. 9. 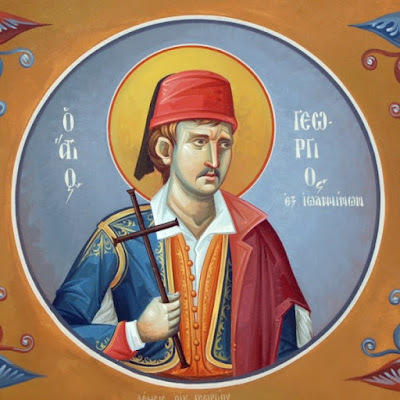 The wife of Anagnostou Oikonomou from Bessane was paralyzed throughout her body, but anointed with the oil from the vigil lamp of the Saint, she was healed. 10. Another woman named Paraskevi from the town of Kotzanopoulo of Lamare, who was totally paralyzed, hearing of the Saint, embarked with piety to go to the Saint, and on the road on the horse she began to move again, and descending the horse, she began to walk until she reached the Saint and totally received her health. 11. 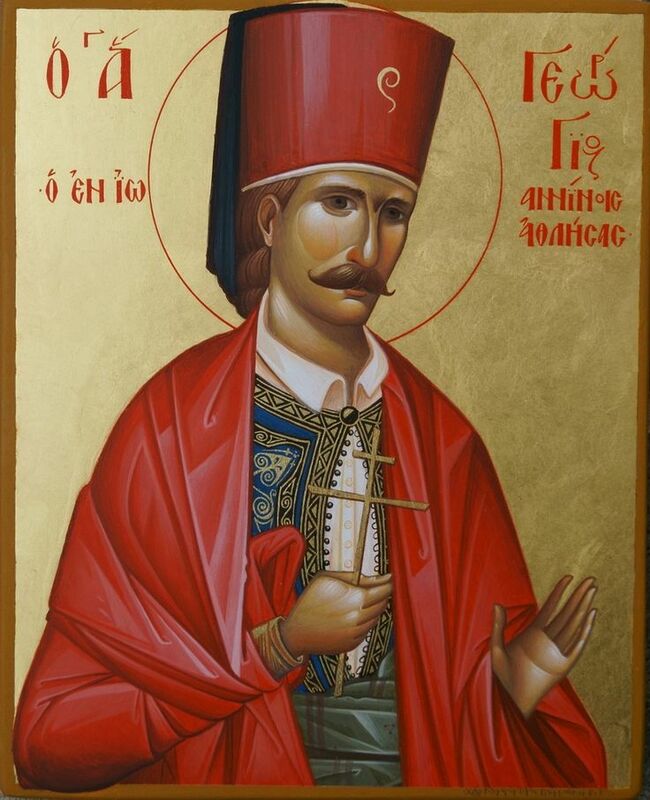 Another, the wife named Chaedo from the town of Kastania of Aspropotamou, suffered from a dangerous paralyzing sickness throughout her body, and prepared to go to Metzovo to visit a doctor, the Saint appeared to her as a young man dressed in his foustanella [a traditional Greek male garment of the time, as he is dressed in icons], and told her to go to Ioannina, for there is a good doctor. She replied that she didn’t have an animal or person to bring her there, and the Saint told her to wait for an animal. The next day a Christian came to her and gave her his animal which brought her to the Saint. And O the wonder! The same day she stood on her feet. Similarly her hands were also healed, which weren’t cleaned for six months, and then she took soap and cleaned them. This astounding miracle of the Saint, along with the above miracles, were related by the then Bishop of Ioannina Joachim, who later became Patriarch, before all the elders of the city. 12. John of Koliou, from the town of Romanon of Souliou, had a daughter named Katherine who suffered from [epilepsy] ceaselessly for eleven years. They came to the tomb of the Saint, took soil from it, and some wax from the candles which burned on the tomb, and returned to their home. The soil they placed in water and gave to her to drink, and the wax they burned, and - O the wonder! - she was freed from her condition. Her father related this miracle to the former aforementioned Bishop of Ioannina with his own lips. 12. 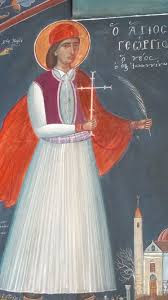 An eight year old girl from the aforementioned town of Kastania suffered from [epilespy] and calling on the Saint, though she suffered from her condition for so long, she was healed, and did not have these problems again. She traveled from there to Ioannina to venerate the Saint, and related this truthfully. 14. 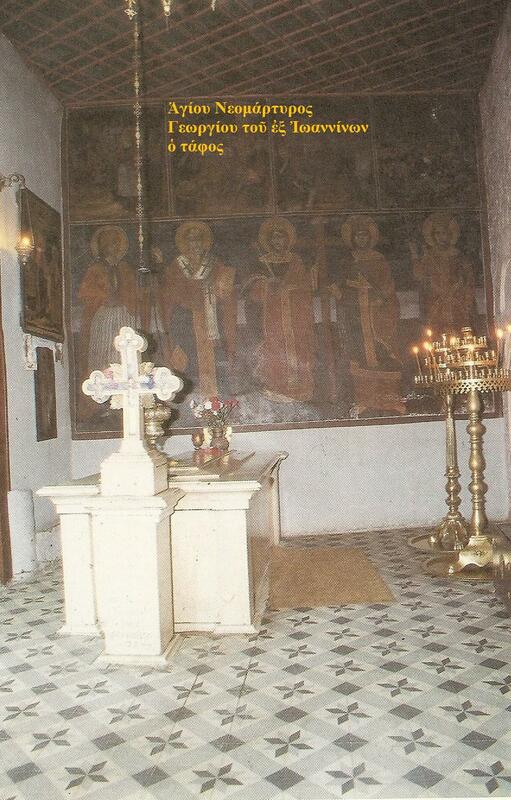 The wife of Zavogiannou Kalarykiotou was troubled by a neurological problem, and paid much silver to the doctors, and not receiving any benefit, received oil from the vigil lamp of the Saint and drinking it was healed immediately. Her husband Zavogiannis, sent straightaway twenty five tallara to the commissioners of the church of the Saint, and a letter of thanks towards the Saint. 15. George, the son of the Steward of the Metropolis of Ioannina, in the 1853th year since the Birth of Christ, in the month of April, suffered [epilepsy] through the devil, and coming to the house of the Saint, remained and fasted for forty days, and the youth was healed fully and did not suffer from this problem anymore. 16. It was May of 1853. An unmarried Christian named Soulto, from the town of Laesta of Zagoriou, came down with a most dangerous sickness of the eye, and couldn’t see the light of day, and losing all hope, was brought to the house of the Neomartyr asking for her healing with all her soul and a pure heart, and after two days, was healed totally of her sickness according to her faith, and glorifying God and the Saint she left with joy and exultation.